Do you know what are the sulfites? Why they are included in wine? It’s time to wine knowledge. One of the most discussed topics in wine field is sulfites. Most of people drink wine without knowing the substances contained inside. They drink only for pleasure! I’m here to tell you something about the sulfites in wine, what are their functions and which are the side effects. The sulfites or sulphites are chemical substances used in food industry as preservatives. They are molecules that contain the sulfite ion, a negative ion composed of sulfur and oxygen with other atoms. For example sulfur dioxide SO2, sodium bisulfite NaHSO3 or potassium bisulfite KHSO3. Their functions are antiseptic and antioxidant. Not only wine contains sulfites. You can find them also in other foods as fruit juices, jams or dried fruits. Every type of sulfite has its own code: E220 for sulfur dioxide, E221 for sodium sulfite, E222 for sodium bisulfite, E223 for sodium metabisulfite, E224 for potassium metabisulfite, E226 for calcium sulfite, E227 for calcium bisulfite and E228 for potassium bisulfite. It’s necessary that they appear on the label of prepackaged products. There is an European Regulations (Reg. CE No 1129/2011) about the quantity contained in every food. If you don’t overdo with sulfites assimilation, you don’t have any problem! Otherwise you can incur the following effects: less assimilation of B1 vitamin, hypersensitivity (especially in asthmatic persons) or intolerant reaction. FAO and WHO suggest to assimilate the daily quantity of max 0,7 mg/Kg body weight. For example, if your weight is 65 Kg you can assimilate max 45,5 mg of sulfites per day. 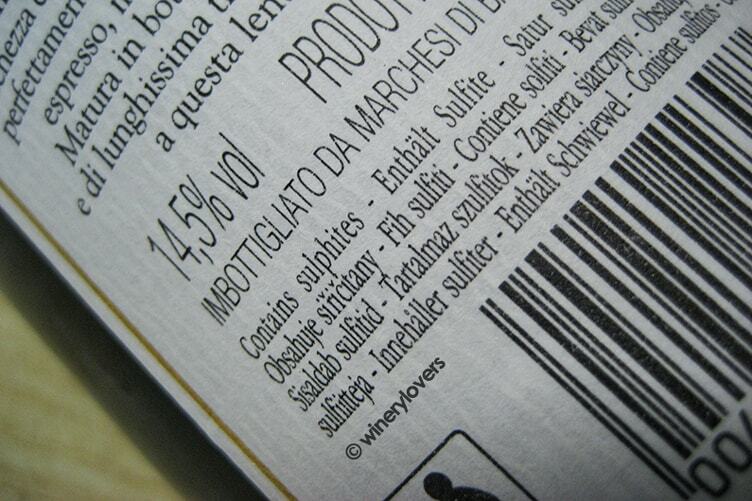 Winemakers add generally sulfites in wine when the grapes arrive in cellar. The quantity of sulfites and the mode of their application depend on many variables as type of grape or wine characteristics. For example the adding of sulfites in red wines is to increase the extraction of color from skins during the maceration. Only the most sensitive tasters are able to recognize the presence or not of sulfites in wine. An extreme addition of sulfites can modify characteristics of the wine. On the nose you can recognize the smells of sulfur, garlic or rotten eggs. The European Regulations (Reg. CE No 606/2009) has established the following limits: 150 mg/L for red wines and 200 mg/L for white/rosé wines. Whereas for wines with more than 5 g/L of sugars, the limits are 200 mg/L for red wines, 250 mg/L for white/rosé wines and more than 300 mg/L for some particular wines. The difference of limits between red and white/rosé wines is that red wines contain polyphenolics. These components support the preservation of wine. There is also a European Regulations for natural wines (Reg. CE No 203/2012). In this occasion the limits are 100 mg/L for red wines and 150 mg/L for white/rosé wines. You can also find wine without sulfites, they have less than 10 mg/L of sulfites. The trend is producing natural wines, but we don’t know yet how long does the ageing takes. There are also natural sulfites: they are produced by grape in the first fermentation. It’s not necessary declare them on the label. What’s your opinion about sulfites? Personally I like balanced wines in sulfites. In my opinion, winemakers can produce an excellent wine independently of sulfites. The most important thing is not overdo drinking, but follow the suggested quantity of wine. Remind that we are wine lovers! Let me know with a comment what’s your opinion about sulfites in wine. If you liked this article, I invite you to share it on Twitter with your friends.